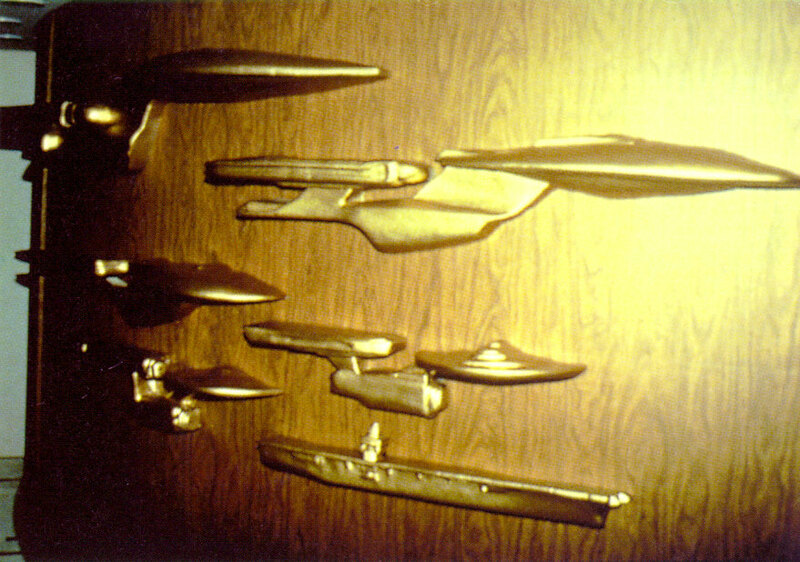 Starship miniatures or decorative depictions of starships appear in many Star Trek episodes and movies. We usually assume that the ships on display, whether they are historical or recent designs, are authentic even if we never see them as "real" ships in space, and they are accordingly listed in the Starship Database. 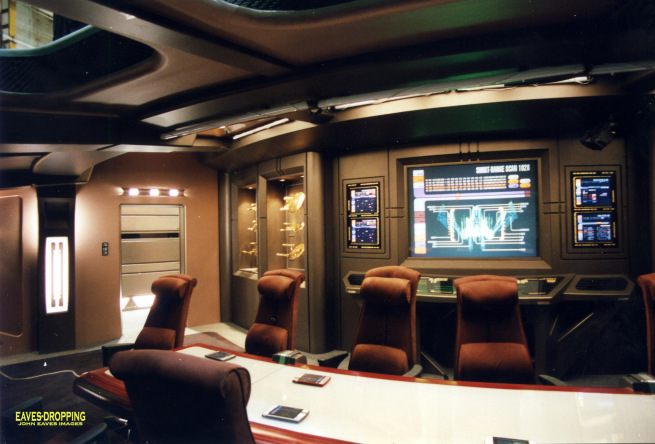 Besides the single models as they customarily appear in private quarters or in the captains' ready rooms, there are also a few design lineages on display, particularly those supposedly of "ships named Enterprise". 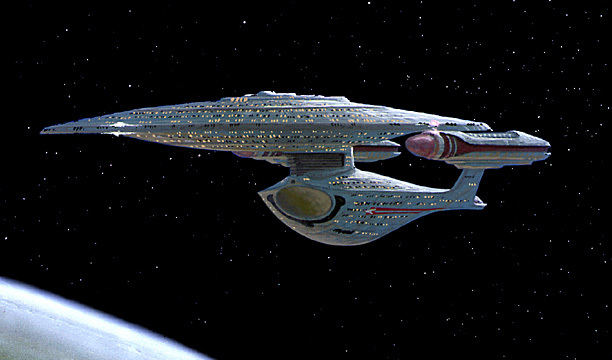 Side note Speaking of design lineages, we have to bear in mind that there is nothing such as an "evolution of Enterprises" but rather an ongoing development of ship classes of Starfleet, a few particular ships of which happen to bear the name "Enterprise". There can be only one Enterprise at a time, and while Starfleet likely wouldn't give an illustrious name to a freighter, there is no reason to believe that in each design generation of capital ships exactly one has to be named "Enterprise". 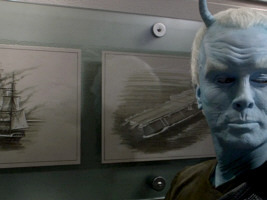 Considering that Star Trek's history is continually subject to retroactive changes, the authenticity of some Enterprise lineages on display in older series or movies has been called into question. Some historically important ships that we should expect to be shown are missing, most notably NX-01 on all displays predating the launch of Star Trek Enterprise in 2001. 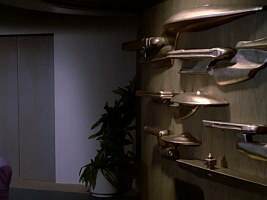 Furthermore, the Enterprise-B and Enterprise-C look different on the Enterprise-D ship wall than they do in "reality". Is there something wrong with the ships on display, or are we even dealing with different timelines in which ships may not exist or may look different? This small article investigates the various "ship walls". All episodes and movies are listed in production order, as usual. Ship wall in "Star Trek: The Motion Picture"
The depicted sailing ship could be any of the early two-masted Enterprises that are listed as brigs but may have been rigged like the depicted brigantine just as well. Considering that "all these ships are named Enterprise", it is clear that the aircraft carrier has to be the USS Enterprise CV-6 and not one of her two sister ships of the Yorktown class. 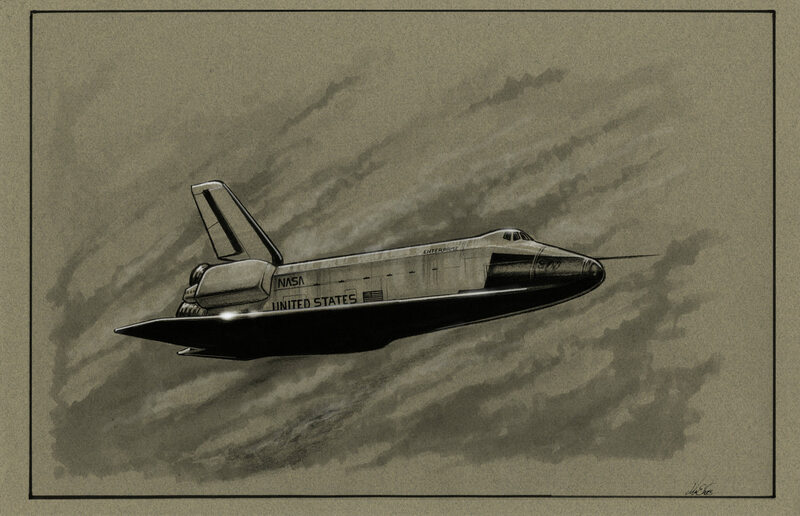 Likewise, we are looking at the Space Shuttle Enterprise OV-101, and not any of the later series orbiters. The movie was filmed in 1979, whereas the series (Star Trek) Enterprise with its lead ship Enterprise NX-01 first aired as late as in 2001. The historical gap between the Space Shuttle and the USS Enterprise NCC-1701 is filled with the ring ship Enterprise XCV 330, rather than with Enterprise NX-01. 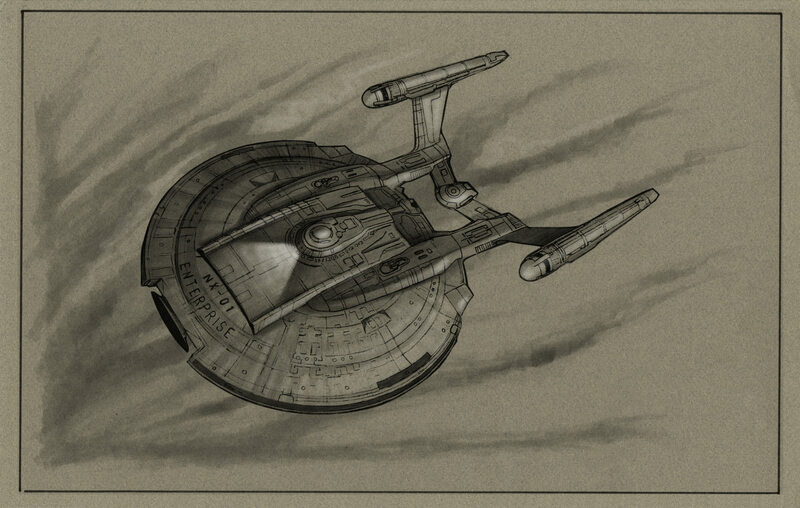 That is why some fans would have expected the ship in the fifth Star Trek series to look exactly like the ring ship. But that would have raised still other problems, considering that the ring drive is a one-off phenomenon on Starfleet's vessels. It is better to assume that it is an experimental design that predates Enterprise NX-01, rather than a regular Earth Starfleet ship. While the ship display in TMP is not supposed to be complete anyway (it is missing a lot of the early ships named Enterprise, and notably the aircraft carrier CVN-65), the only remaining question is why it depicts the "exotic" testbed XCV 330. But a possible answer to this question is easy, comparing the five depictions. They may have been selected to show as much diversity of designs as possible, from the wooden sailing ship over the bulky aircraft carrier, the streamlined orbiter, the test ship with its flimsy ring drive to the Enterprise NCC-1701 with its two warp nacelles. Whoever composed this ship display in the 23rd century may have been of the opinion that Enterprise NX-01 was too similar to the Enterprise NCC-1701. 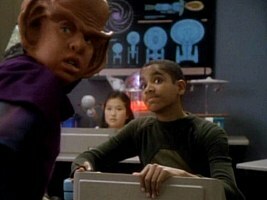 Side note Real-world developments will lead to even more retroactive continuity in the Star Trek Universe. 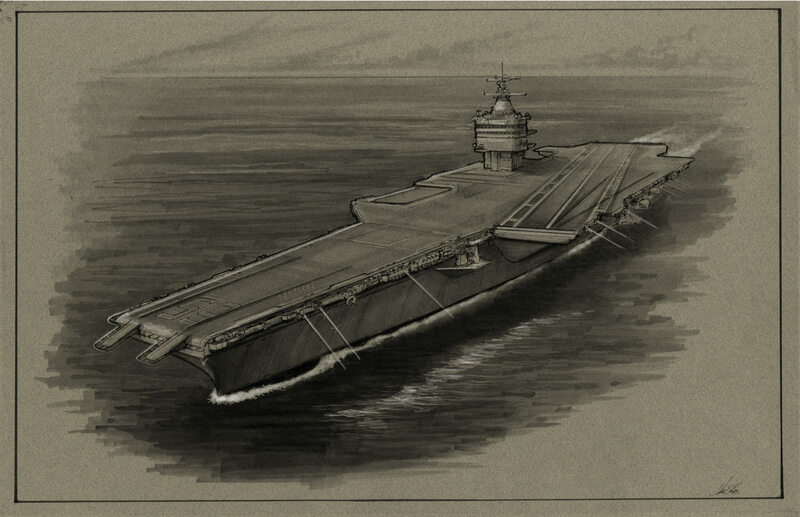 The next US Navy aircraft carrier named USS Enterprise (CVN-80) will prospectively be launched in 2025. Ship wall in TNG: "Coming of Age"
Ship wall in TNG: "The Last Outpost"
It is never explicitly hinted at and, strictly speaking, only the aircraft carrier has to be named Enterprise because it is the only vessel of its class. Still, it is clear that all ships on the wall were meant to be Enterprises at the time the set was built for TNG (in 1987). 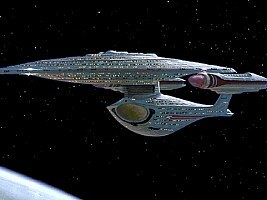 In particular, we can see all Federation starships named Enterprise that must have existed at the time the Enterprise-D was launched, namely the USS Enterprise NCC-1701 (in its original configuration) and the following Enterprises A through D. However, there are several retroactive changes to the Star Trek Universe that lower the "confidence level" of the sculpted ships as we look at them today. 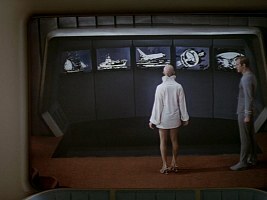 As already in "Star Trek: The Motion Picture" (TMP), Enterprise NX-01 is missing on the wall for obvious reasons, but the ring ship that is definitely named Enterprise according to TMP is not present either. 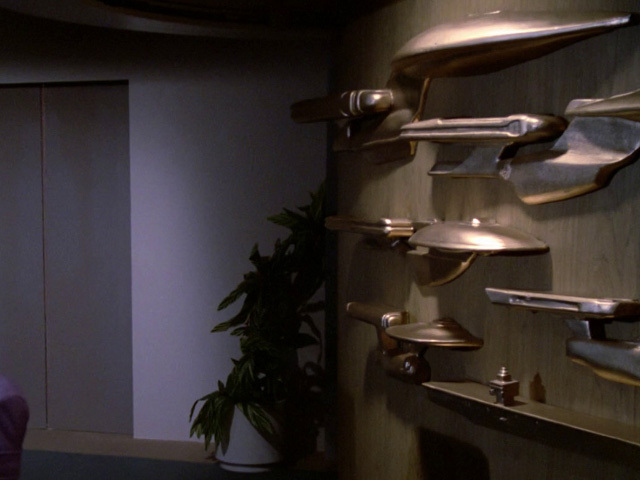 We could say that, unlike in TMP, the ship wall on the Enterprise-D was designed to depict all the recent Federation Starfleet vessels named Enterprise, and not primarily a wide variation of ships of that name. If this is the case, we still have to wonder why the ancient aircraft carrier was included, creating a gap of more than 250 years. Assuming that all ships on the wall are named Enterprise, two of them don't look like they do in reality. The first one is the Enterprise-B, the direct successor to the Enterprise-A as established in "Star Trek VI: The Undiscovered Country" and "Star Trek: Generations". 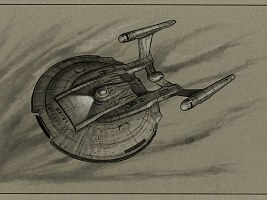 In the latter movie the Enterprise-B is launched with several add-ons compared to the original Excelsior design, such as a hull extension around the deflector, additional impulse engines and Bussard collector caps. These differences are not included on the relief on the ship wall. 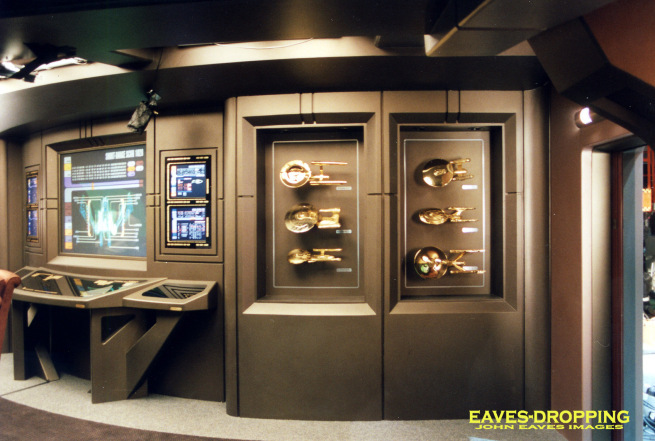 So the ship wall is either inaccurate and erroneously shows the original Excelsior design although it should be the refit, or the Enterprise-B was returned to the configuration of a standard Excelsior at a later date in the ship's service life. 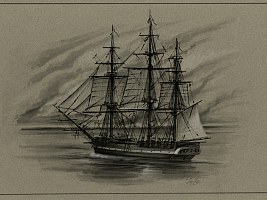 In the latter case the ship may have earned more fame in this "standard" appearance, and was chosen for the ship wall in spite of its less spectacular look. 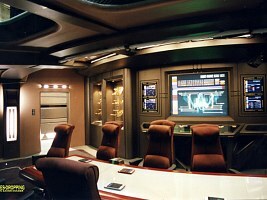 The second ship on the wall that looks different than it should is the Enterprise-C. The relief on the wall is based on Andrew Probert's original design, which was never made into a fully fledged studio model. In TNG: "Yesterday's Enterprise" we see the actual Enterprise-C. 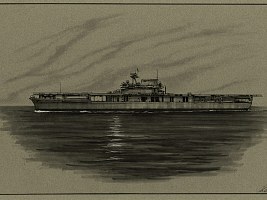 It is the familiar Ambassador-class design by Rick Sternbach and Greg Jein that only roughly follows the lines of Probert's sketches and was overall simplified. Most notably, the hull of the Enterprise-C in "Yesterday's Enterprise" is tubular instead of the flattened and streamlined one of the Probert design. 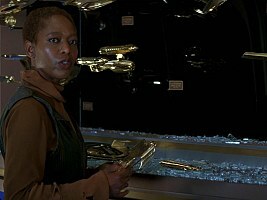 Unlike it is the case with the Enterprise-B, there is no other canon evidence of the design representing the Enterprise-C on the ship wall. Yet, it is well possible that a so shaped ship class actually exists, and that the artist who created the ship wall mistakenly thought the Enterprise-C was of this class. And as already in the case of the Enterprise-B, there is a chance that the Enterprise-C really looked like the ship on the wall, but in this case at an earlier time in the ship's life (in which case it would be shame it was turned into a rather bulky standard Ambassador). Ship showcase in "Star Trek: First Contact"
The Excelsior refit, Ambassador and Sovereign were not yet available as polystyrene model kits at the time and had to be built from a Playmates toy, a resin kit and from scratch based on a study model, respectively. More about the models and the set at Eavesdropping with Johnny. In HD, we can read the individual labels of some of the ship models, including the Ambassador-class design, that all read "Enterprise". It is clear that the ships are supposed to be the original USS Enterprise NCC-1701 and its successors A through E. In other words, the complete lineage of ships named Enterprise in the service of the UFP Starfleet, and nothing else. It is absolutely plausible that not only any sailing ships, aircraft carriers or the Space Shuttle are missing, but also Enterprise NX-01. 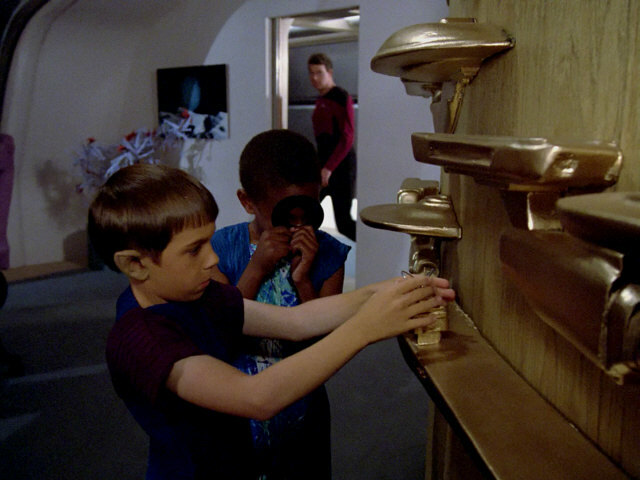 In comparison to the Enterprise-D ship wall it is clear that retroactive continuity has taken full effect. The Enterprise-B and Enterprise-C now both look like the "real" ships that previously appeared on screen. Ship showcase created for "Nemesis"
The glass cases as they were actually finished for "Star Trek: Nemesis" only contain two sets of the six Enterprises and none of the extra vessels because by the time John Eaves had built them the glass cases were already filled with the duplicates of the Enterprises. Only the left showcase can be seen in the movie anyway. So this gives us the same list of actual models as for "First Contact". More about the "lost" models and the "Nemesis" set at Eavesdropping with Johnny. 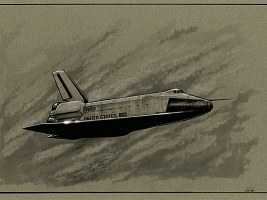 Ship gallery in ENT: "United"
John Eaves posted the following large versions of the four drawings on his website. 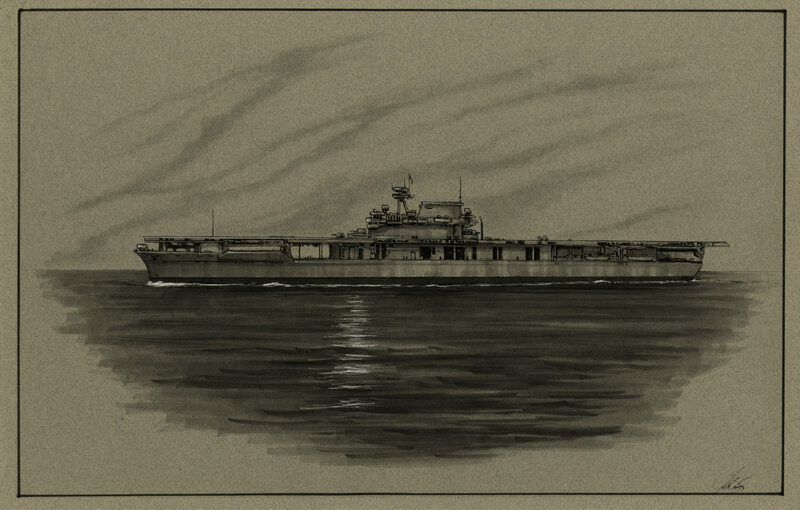 Actually, John Eaves created an additional fifth picture of the aircraft carrier USS Enterprise CV-6, which didn't make it on the wall. Overall, this "ship wall" looks like a very balanced and diverse selection of ships named Enterprise, a bit like already in "Star Trek: The Motion Picture" but with some retroactive continuity regarding the omission of the ring ship XCV 330, which is currently considered to be just a testbed for a new propulsion technology. 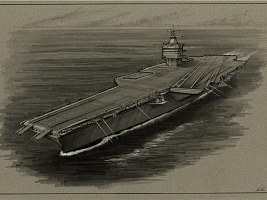 The appearance of the XCV 330 in the 602 Club in "First Flight" and in Admiral Forrest's office in "Home" proves that the design was not simply forgotten. 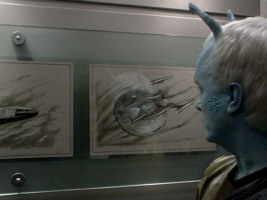 Wall chart in DS9: "The Nagus"
The five Federation starships happen to represent the five starships named Enterprise that existed at the time the episode was made. As the episode predates "Generations", we can see a standard Excelsior class, rather than the Enterprise-B with add-ons as it looks in the movie. Since the display probably wasn't created in-universe with special focus on the name "Enterprise" and there is no reference to "ships named Enterprise" but only to the generic class names on the chart, this is not a problem though. 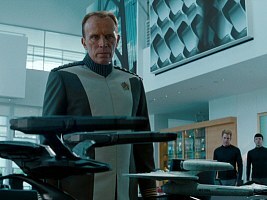 Ship model collection in "Star Trek (2009)"
Admiral Marcus has a number of aerospace and starship miniatures in his office. 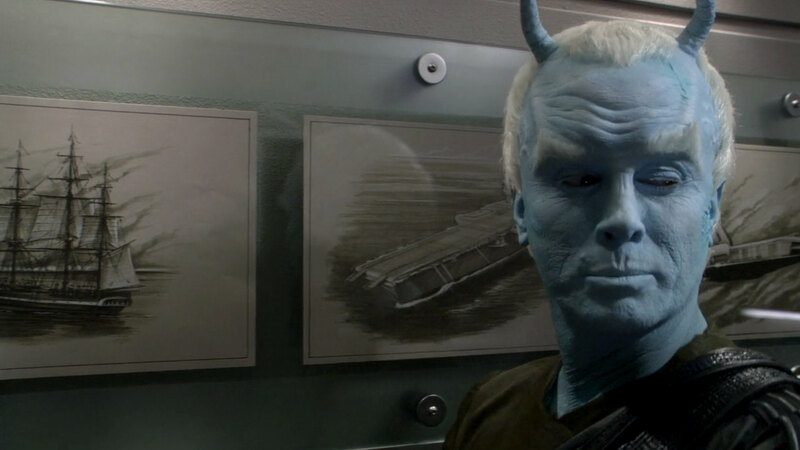 He has no special ties to the Enterprise, to Captain Pike, Kirk or Spock, so there is no reason to believe he would focus his collection on ships named Enterprise, unlike it was the case with the aforementioned ship displays aboard ships named Enterprise. The only curious fact is that he also has a model of the top secret USS Vengeance on display. 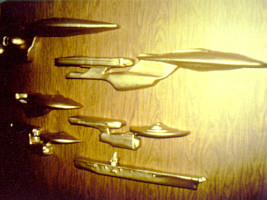 The various "ship walls" were never meant to be technically accurate depictions of starships or complete listings of all ships named Enterprise. 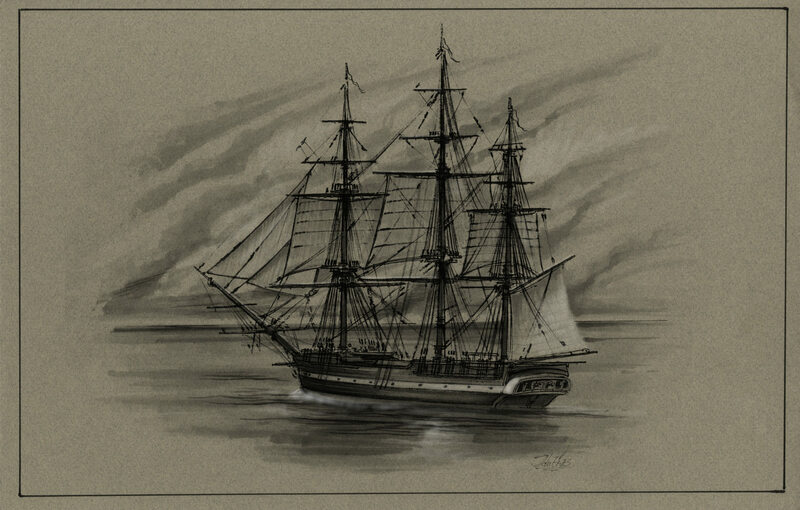 It is clear that there is artistic license in the artwork, and that the selection of the ships on display may be randomized or may follow a pattern that is not immediately obvious. 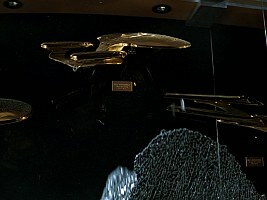 Of the four different Enterprise design lineages that appeared in episodes and movies, the two most recent ones in production order, on the Enterprise-E and Enterprise NX-01, are up to date and completely plausible. They show the ships named Enterprise that we would expect to see there. 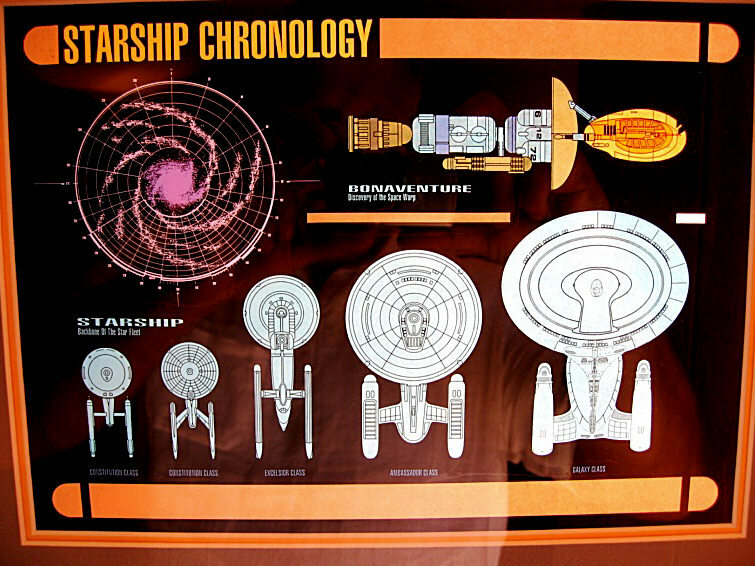 The ship display in "Star Trek: The Motion Picture" may appear outdated considering that it includes the ring ship in the place of Enterprise NX-01, but it makes sense because it presents the widest possible variety of designs in just five depictions. This leaves the ship display on the Enterprise-D as the only one that may come across as retroactively "unreliable". 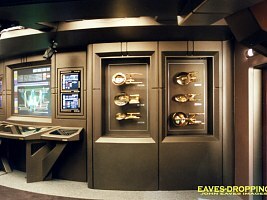 The real Enterprise-B and Enterprise-C as seen in "Star Trek: Generations" and "Yesterday's Enterprise", respectively, don't look as they should on the ship wall. Yet, we can deal with these small inconsistencies with common sense. 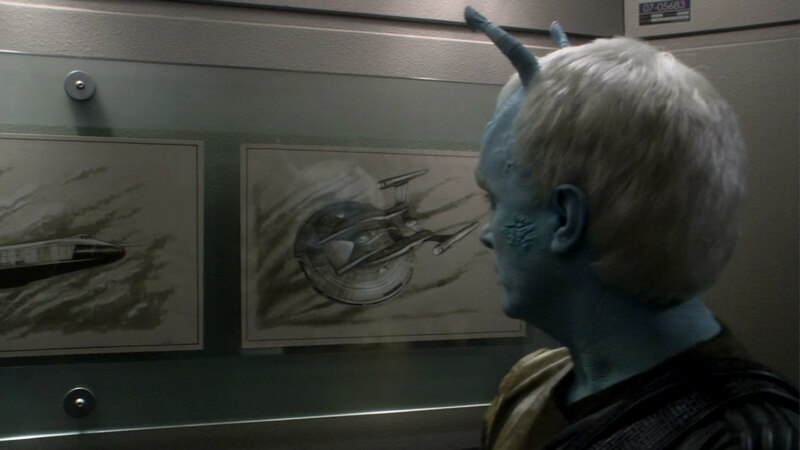 There are very good rationales why these two ships look different on the wall and there is no need to resort to far-fetched parallel universe theories to explain them. Some screen caps from TrekCore. Thanks to Colin for additional canon references.